FQ: You mention early in the book that it was important to introduce the reader first to the other dogs in your life before meeting Moses. 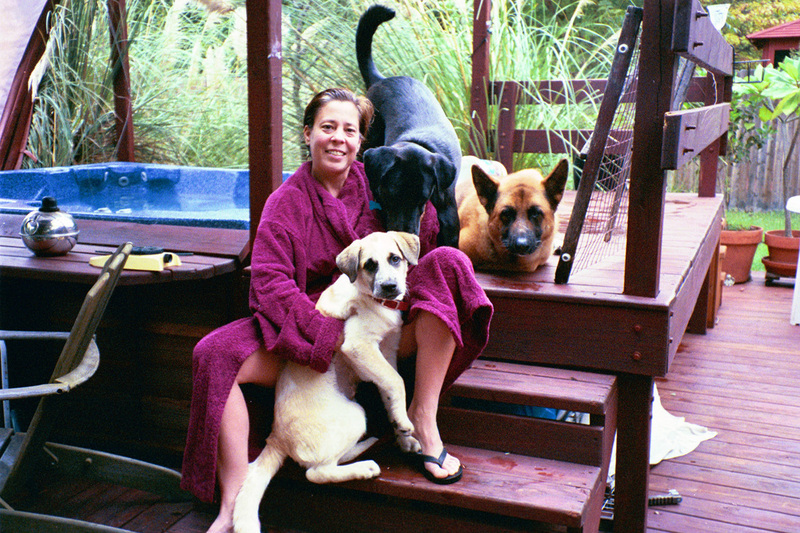 What made you decide to include all your special friends rather than simply write a book about one dog? I actually did not start out with the intention of writing a book at all. Initially, I was just journaling through Moses' illness. As his death became imminent, I kept journaling simply as a means of channeling the grief. Then, I began to experience a desire to find a way to let Moses' life and death make a difference to others, to allow him to live on in some way. As this desire came over me, I realized that I may never have even looked for Moses if there had not been Odin in my life and how all of the dogs in my adult life were truly related. I could not tell the story of one without the others. Even so, it was several months after the manuscript was finished that I made the decision to publish and put the story out in the world. FQ: I loved the story of Cleo and her big rawhide bone vs. the doggie door. After that first incident, did she ever try that type of exit again? Ah - that was a funny scene. Though we did spoil her with the large chews a few other times in the future, we gave them to her outside so there wouldn't be the problem of getting them through the doggie door. However, she would try to come back inside with the chew ... though not as humorous, as the drive to come inside was not as strong as that drive to initially run outdoors with the newly prized possession. She would just turn around and decide to stay outdoors to enjoy her prize. FQ: In addition to all the anecdotes, you include a fair amount of information on each breed, including AKC standards. Was it important to you to include this factual information? What do you hope the reader will gain from it? Sometimes people get stuck on one breed, or they don't even realize the differences in the many breeds that are out there. I felt it important to present the reader with the factual breed information in addition to my opinions, feelings, descriptions of the breeds -- to reinforce, as well, that there are resources on which to base decisions concerning choices in pets and what those resources provide. FQ: There are several mentions to spending time searching the Internet for puppies/dogs. Do you still find yourself searching popular sites for dogs in need of love? Yes, I'm afraid I'm very afflicted. I have to force myself to turn away. The people that work with the rescue groups and handle multiple fosters are truly angels. I wish I could do more. I am gravitated to every pet adoption event I see, knowing I cannot add another dog to our family at this point. I still want to see them, look in their eyes, speak sweetly to them, say a prayer, try to come up with someone I know that might want to adopt. And, of course, make a donation. I also watch every dog show I can on television and cheer on my favorites! FQ: I was very touched by the story of how Samantha helped you through your panic attacks. 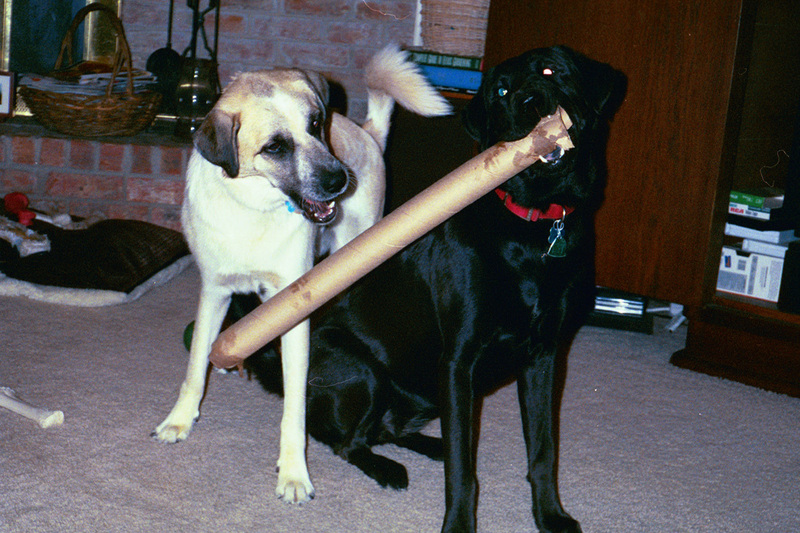 Would you share with us a few other examples of how your dogs helped you through hard times? 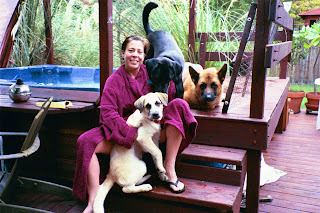 Before I met my husband, George, Cleo was my constant companion. When I was sick, she would not leave my side. Even after George and I married, there was a rough patch in my life where I was not working and having a very difficult time with that - such that I did not want to get out of bed for a few days. Again, Cleo was there, my ever-present, non-judgmental friend. 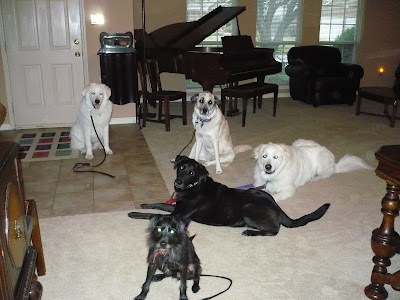 Each of my dogs has been a source of joy and inspiration. Every day that I would come home from work feeling like a Mac truck had been run over me and backed up and done it again, when I walked through the door and was met with smiling faces, wagging tails, and sloppy, dog kisses, I knew everything was alright. Still, to this day, being greeted so enthusiastically by my crew grounds me like nothing else I know. FQ: Reading about Moses attending his first "Pyr Picnic in the Park," I felt as if I knew him and was quite proud of his achievements that day. What was that day like for you? 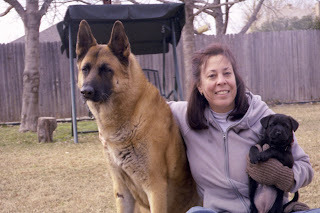 Well, my parents had a kennel, raising show-quality German Shepherds. It is, of course, somewhat "elite" in the dog world to be involved in that realm. As a dog lover, and being exposed to what "showing" is about, I had always wished, fantasized about having a dog that I could groom and show and would be awarded these special titles. They are special. However, spending the money on a purebred with just the right qualities and going through all the competitions, etc., was something I'd never do. 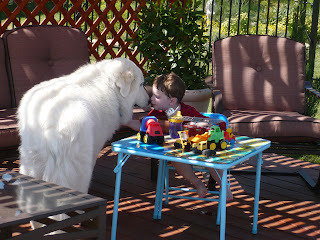 That "Pyr Picnic in the Park" gave me the opportunity to "live the dream." It was a very special day for me and for Moses. I was so proud of him -- not only how he "handled and moved" in the ring, but getting his therapy dog certification was the absolute pinnacle! What an honor. And, he certainly was the man-about-town for that day. He loved the attention so. And his ribbons are still proudly displayed in my home. FQ: You talk about the importance of rescue groups in your book. What would you tell our readers today who are looking to add a dog to their lives? I would say to do your homework -- read up on the various types of dogs and their needs, understand your lifestyle and what you want from a dog and what you're willing to do. I would also say, if at all possible, get two dogs so that they have company apart from their humans. The dogs will be much happier, which means a lot less headaches for the owner. If you are stuck on a particular breed, there are many breed-specific rescue groups - many. 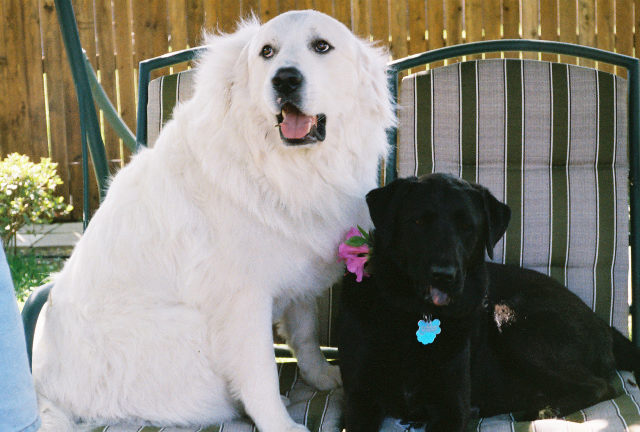 Otherwise, there are also many pet rescue groups that have dogs of "colorful" backgrounds. These dogs can be just as loving and wonderful as the purebreds. My veterinarian told me that he often felt that mixed-breed dogs tend to exhibit the best of both breeds - which we saw in our Odin. At that point, it's best to decide if a small, medium, or large dog is what you're after. The volunteers with the pet rescue groups will also offer advice. But, know that a dog is a responsibility to be taken seriously. Also, if someone is not quite sure, they can offer to foster a dog through one of the pet rescues and in that way get to know the dog(s) better before making the forever commitment of pet ownership. 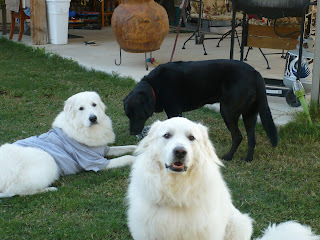 FQ: Captain, the little neurotic terrier, vs. Moses, the laid-back, giant Pyrenees. How funny they must have looked together. Did they ever have any further run-ins after that first, loud roar from Moses? This was a very interesting dynamic. As described in the book, Moses truly did not get involved in the "drama" of Captain until Captain forced it. After that one encounter, Captain never again challenged Moses in any way. When Captain walked in our home it was as though he had blinders on (like a race horse). He would look forward and pretend not to notice Moses, which was just fine with Moses, too. Moses did not hold a grudge, he really didn't want to have to insert his dominance, he just wanted to co-exist. When they were together, Captain respected Moses and his space, and Moses left Captain alone. FQ: As a horse owner, I know that white horses are more susceptible to certain cancers than their darker colored stablemates. Is it the same with white pyrenees? I'm not sure about cancers. But, I do know that Pyrenees, because of the pigmentation, are very susceptible to sunburn. Many people, unadvisedly, will shave the Pyrenees down to the skin in summer, intending to help with the heat. However, because of their light, skin pigmentation, it only serves to expose them to extreme sun damage. It is better to allow the hair, especially on their top-side, to provide cover to their skin. Shaving the under-belly can help to make them cooler without exposing them directly to the sun's rays. 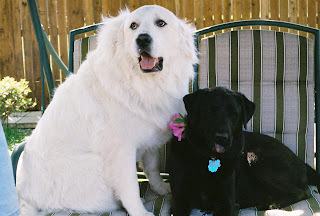 The Great Pyrenees is susceptible to luxating patella issues with their knees and to hemangiosarcoma (like Moses) and bone cancers (like many large-breed dogs) but I'm not aware that any of those issues are directly related to their pigmentation. 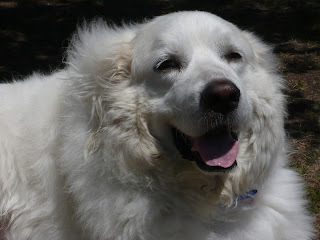 FQ: What would you tell anyone thinking of adding a pyrenees to their household? Cautions? Pros. vs. cons? I would say first and foremost that you must be ready to enjoy dog hair as a condiment (and not be into black - or be ready to have your beloved black pants covered in long, white hair). You must not be the type of person that has to have everything in their house in order and perfectly clean. These are large dogs with lots of hair. Leaves and brush attach themselves to the dogs and get carried in. It's a fact of life. 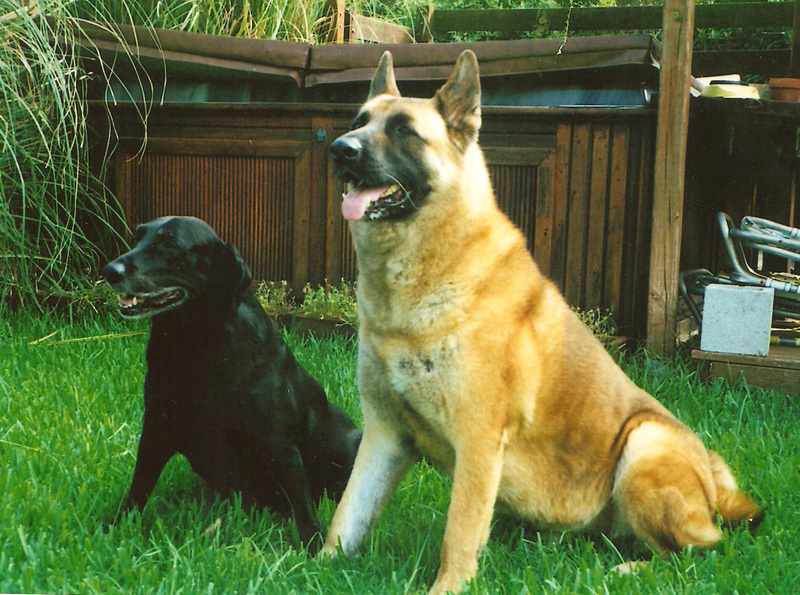 You need to be aware that these dogs are extremely intelligent and strong-willed. 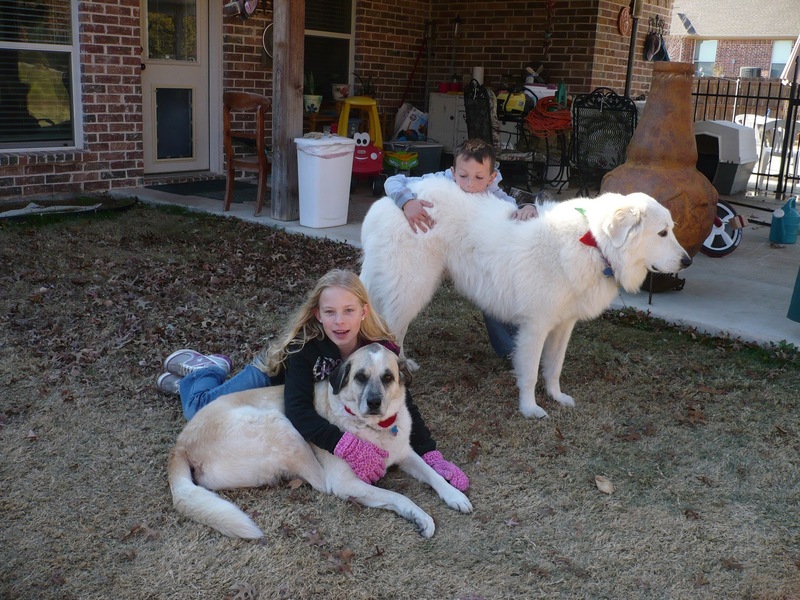 You do not force a Great Pyrenees into submission. It doesn't happen. However, they are extremely gentle, loving and devoted. If you earn their respect, you have a friend and protector for life. We have our dogs in Texas - which can be brutally hot. They certainly love the air-conditioning, however their coats actually act as insulation to the heat. Though they are white, their coats shed dirt naturally, so there is not a lot of "cleaning" needed -- just let them dry off and the dirt falls off. Brushing, though, is important to avoid matting in the coat. We generally brush at least once/month when they are bathed. 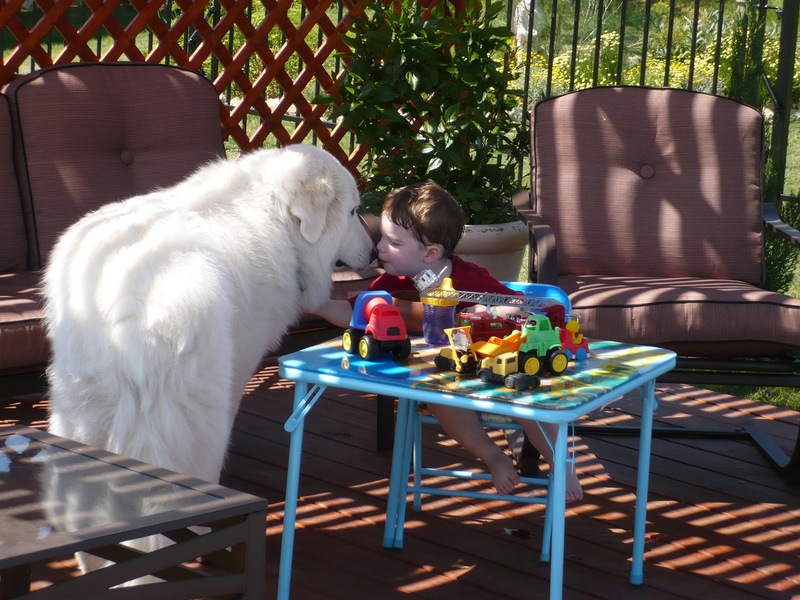 Most Great Pyrenees are great with other dogs, cats, and children (though there are exceptions). Also, as with any large dog, left unattended and untrained they can be very destructive. I found with several of my dogs that it was almost a competition, that I was going to outwit them each step of the way so that they couldn't destroy the yard, destroy the furniture, etc. If you truly are in tune with your dog and one step ahead and patient (like with a child), you can ensure that all will be well between you. Also, to contain a Pyrenees you need to have a tall, secure fence as these guys tend to roam if they find freedom. It's in their blood, being livestock guard dogs they wander the country-side watching over flocks. 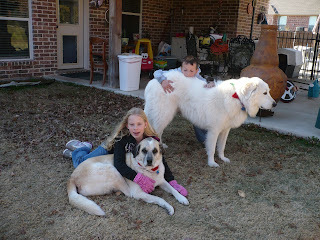 But, I can tell you there's nothing like a big, Pyr hug. There's nothing like those soulful eyes. There's nothing like a massive, strong companion who's got your back because he knows you've got his. To learn more about The Story of Moses please visit our website and read the review at: Feathered Quill Book Reviews. I'm glad you found the interview informative. It is true that Pyrenees are not for everyone and it's important that people realize that. Part of the issue I think we see in pet rescue circles often is people getting that cute, fluffy puppy only to realize it quickly grows into this big dog that perhaps they don't have time to deal with, or don't quite know how to train, or didn't realize would be so much work, etc. The flip side to that is to educate that there are certainly many other dogs out there -- from extra-large to extra-small and everything in between -- ready to love and be loved. Awwww..... such cute pictures. Thanks for sharing, enjoyed the interview! I enjoyed the interview and seeing the pictures.